Covers are printed digitally in full color on the outside (sometimes known as 4/0). Printing on the inside of the cover is also available for softcover only in full color (4/4) or in black only (4/1). Some restrictions apply, contact us for details. Our standard paper stock for softcovers and spiral book covers is white 12 point C1S, a heavy-weight stock coated on one side. We also offer 80# white Lynx opaque cover, and 80# natural Cougar opaque cover at additional cost. We can mail you a paper sample booklet to see exactly what our papers look and feel like. 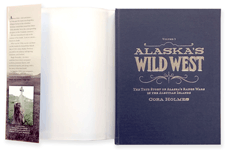 For hardcover book covers that are printed and laminated or have a dustjackets, we use 100# white Titan Book paper stock. Standard hardcover books are covered in ArrestoxB bookcloth, with 10 standard colors to choose from (many special-order colors are available). For imitation leather covered books we offer 5 colors. Standard foil colors are gold, silver or white foil, but many custom colors and are also available, including black, blue, red and copper. Hardcover stamping is done with a copper die that is created from a black and white design. Pricing depends on the square inches of the die, larger dies cost more. All hardcover books have two endsheets, one in the front and one in the back. Their function is to help hold the bound book block to the front and back cover. Specialty papers and colors for endsheets are available at extra cost. Printing on the endsheets is available at extra cost. Contact us for details. A variety of foil stamping and embossing treatments are vailable for all binding types. Call for pricing on your project. We laminate all our printed covers as this is the best possible protection for a cover. We offer two finishes, gloss and matte. Our standard is gloss, the shiny characteristics of the gloss finish make the colors "pop." The subdued look of the matte finish is a much "softer" feel and is slightly more opaque to the colors underneath at additional cost. Interior pages are printed digitally in black-and-white or digital color (or a combination of some black-and-white pages and some color pages). Our standard interior page paper is 60# white Lynx opaque, ordered in large quantities, resulting in savings for you. Other colors or weights can be special-ordered upon request. We can mail you a paper sample booklet to see exactly what all of our papers look like. Our primary paper stocks are FSC, SFI and Rainforest Alliance certified. This means the production of our stocks passes a high level of scrutiny from multiple independent organizations devoted to responsible sourcing. We also recycle 100% of the byproduct from both our paper processing as well as our printer waste (toner, toner cartridges, parts, etc). We are also highly involved in the Clean Planet Program which is spearheaded by Konica Minolta.